If you’re not familiar with veganism, the vegan lifestyle can seem quite mysterious to you. The term “vegan” might even have a negative connotation for some who connect the word with overly picky eaters hell-bent on proselytizing all around them to their chosen way of life. But in reality, veganism is just a simple dietary choice; while vegetarians forego meat, poultry, and sometimes fish, vegans take things one step further and refrain from consuming any animal products or by-products such as eggs, dairy foods, and even honey. Some vegans expand this practice into their non-consumable habits, abstaining from purchasing any leather, silk, fur, wool, or cosmetic products that contain any animal-based ingredients. Though the term “vegan” is a relatively young one (it was coined by Donald Watson in 1944 when he co-established the Vegan Society of England), the market has caught up to this increasingly popular way of life. These days there are plenty of vegan options available on- and off-menu, and today’s trailblazers have a variety of options at their fingertips when it comes to outfitting themselves in a top-to-toe vegan-friendly wardrobe. So what are the best vegan hiking boots available for the modern creature-friendly mountaineer? Wait: What Are Vegan Hiking Boots? Now that we’ve got you solid on what it means for a person to be vegan, let’s take a look at what it means for a shoe to be vegan. Chances are, you have at least a couple pairs of vegan shoes in your closet already: for a shoe to be vegan, it simply must be made without animal products or products that were tested on animals. So, no, those leather pumps don’t qualify as vegan, but those canvas sneakers might not either — some glues involved in shoemaking may contain animal products. But these days, manufacturers typically designate their footwear as vegan so you don’t have to do too much detective work to ensure your synthetic leather flats are 100 per cent animal- and cruelty-free. Luckily for outdoor aficionados committed to a fully vegan lifetsyle, there are a variety of choices of vegan active lifestyle footwear available today. This is thanks in part to the high instance of synthetic materials used in making shoes and boots suited for high activity in multiple kinds of climates and environments. The mesh, microfiber, and rubber used to make your favorite pair of hiking shoes not only create a lightweight and water-resistant product, but they do so without harming or borrowing from a single living creature. As an added bonus, these synthetic materials are typically much cheaper than those that are animal-based…as anyone who’s ever had to foot the bill for a pair of genuine leather knee-high boots will confirm. You might be tempted to assume that vegan footwear is also environmentally friendly, but that’s not always the case. If you’re concerned about your carbon footprint, choosing vegan products is generally a more ecologically friendly way to go, but there are significant concerns on both ends of the spectrum. Animal products like leather and fur are obviously taxing on the environment. The process of raising animals for their skins, fur, wool, or other byproducts involves demolishing woodlands to make way for grazing-friendly pastures, along with the demands of feeding large amounts of said animals and the effects of the often-used antibiotics that infiltrate our food system and water supply. Additionally, treating or tanning animal skins involves the use of several heavy duty chemicals, including hydrogen sulfide, chromium, and ammonia, which can also find their way into our soil and water. The tanning industry is a large concern of environmental groups around the world as well as the United Nations. Tanneries are huge sources of toxic pollution in several countries across the globe. The production of synthetic materials—while less problematic in some ways—has its own downfalls. Faux leathers are typically petroleum-based, which means they require the use of toxic chemicals to produce. Other synthetic leathers contain polyvinyl chloride (PVC), and the phthalates (chemical additives) within PVC is associated with several health problems in humans. Some leather alternatives use a blend of polyurethane and cotton, which—while better than PVC—is still not entirely eco-friendly. Even cotton takes its toll on the environment, since it requires a large amount of water and pesticides to produce in bulk. But some manufacturers are trying their best to create footwear with the smallest possible carbon footprint. Some companies utilize recycled polyester and other upcycled materials in the manufacturing of their vegan shoes, and some even allow consumers to return their used shoes to be used in the production of new ones. Even if you think you have the materials of your vegan shoes on lock, there’s still the issue of where the footwear is actually being made. If a company has its factory in Asia or another country where labor laws are much more lax than those in the United States or Europe, you may not be able to determine for sure if that vegan hiking boot you’re buying is the real deal. That being said, there are several reputable companies that have been supplying hikers with reliably vegan footwear for years, with scores of satisfied customers singing their praises. Let’s take a look at some of the best vegan hiking boots on the market today. Specific features: The Scarpa Charmoz GTX 2014 has a rubber sole, articulated Tri-Flex ankle, friction zone for optimal climbing performance, Gore-Tex for water resistance, low-profile lacing, semi-automatic crampon compatibility, and a seven-inch shaft from the arch of the boot. Best use: Walking, climbing, and mountaineering are perfect activities to embark upon with the Scarpa Charmoz Pro GTX 2014. An acronym for “Societa Calzaturiera Asolana Riunita Pedemontana Anonima (Associated Shoe Manufacturing Company of the Asolo Mountain Area), the family-owned Italian company Scarpa (also Italian for “shoe”) began producing some of the world’s best performing active footwear in 1937. The Scarpa Charmoz GTX 2014 carries on the innovative Scarpa tradition with its lightweight versatility and reliable Gore-Tex water resistance. Far from a clunky, unyielding hiking boot, the Scarpa Charmoz has an articulated Tri-Flex ankle to provide just the right amount of give without sacrificing full support. Although this boot is appropriate for all seasons and climes, users report that a thermal insert is helpful for retaining heat for a more comfortable winter hike. Users also claim that this hiking boot takes far less time to break in than some other options, making it a popular item for mountaineers who need a ready-to-go boot right out of the box. 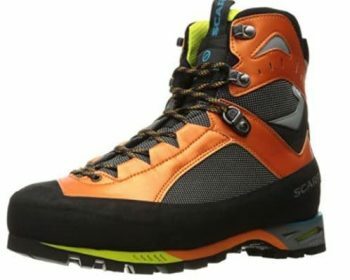 Related: The Scarpa Men’s Kailash GTX Hiking Boot provides unbeatable traction with proven water-resistance to ensure a fully supported (and bone dry) day on the trail. Specific features: This shoe offers the climashield waterproofing system, zig-zag upper overlays, asymmetric quick lacing with lace garage, Sensifit construction for perfect support, signature Salomon 3D chassis, Contrary traction outsole, and removable Ortholite footbed. Best use: The Salomon Men’s XA Pro 3D CS WP Trail Running Shoe is perfect for—you guessed it—trail running. This sturdy, all-weather shoe is fit to take to the most adventurous trails and climbs while providing you with reliable grip and traction. Sporting a handy Kevlar Quicklace that gives you pull-and-go toggle lock convenience with a customized fit, the Salomon Trail Running Shoe also features Contragrip outsoles which utilize a special blend of rubber to give you optimal grip on both wet and dry terrain. The removable OrthoLite footbed is a pro at shock and odor absorption, and your instep will always be secure thanks to the well-ventilated mesh uppers with synthetic overlays. The lug design of this hardy shoe is described as no less than “aggressive,” and the protective toe caps match this spirit with their unyielding protection from unfortunate bumps, blows, and abrasions. Users deem this a good beginner boot for someone just starting out on the trail, noting that at its price point, it’s the perfect blend of quality, functionality, and value. 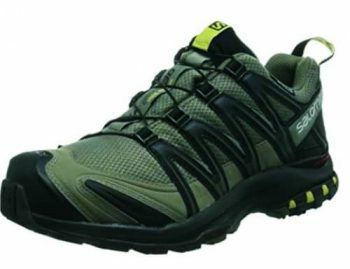 Related: The Salomon Men’s Speedcross 3 Trail Running Shoe is an airy-light and well-fitting shoe that provides perfect traction as you trip the trail fantastic. Specific features: This high-octane hiking shoe features a breathable mesh lining, contoured footbed with organic odor control, metal hook and lacing closure, Uni-Fly impact absorption system, and a Bellows tongue to deflect debris. Best use: The Merrell Capra Bolt Air is a fantastic choice for warm weather hikes and trail running. A high-quality offering from one of the world’s premiere purveyors of outdoor apparel, the Merrell Capra Bolt Air is an expert of resistance: resisting water, odors, and slippage on even the trickiest terrain. Trail runners will fall in love with its Uni-Fly impact absorption system, which distributes the force of impact and provide a secure base as you launch into your next step. The folks at Merrell urge to you “embrace your inner mountain goat” in this stylish vegan hiking shoe, and it’s not hard to do: the 4 mm lug depth and traction-happy outsole will have you skipping from rock to rock like a natural. The Bellows tongue prevents debris from making its way from the trail to your instep, and you’ll never have to worry about errant laces with the Capra’s secure metal hook and lacing closure. Users love this shoe’s ample arch support and lightweight design that provides the ultimate in comfort without the need for breaking in. 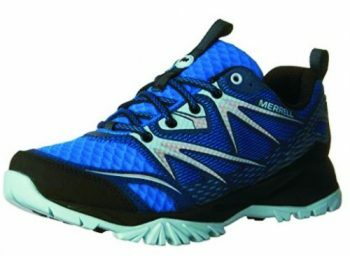 Related: The Merrell Women’s Grassbow Air Trail Running Shoe has all the high-tech bells and whistles of the Capra Bolt Air to provide optimal support, air circulation, and odor control while also looking stylish enough to wear while off the trail. Specific features: This lightweight hiking shoe features a Vibram sole, Bellows tongue, breathable mesh, Omni-Fit lacing system, cushioned UniFly midsole, molded TPU heel counter, and hollowed 5 mm lugs. 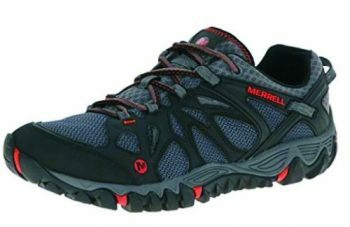 Best use: The Merrell Men’s All Out Blaze Aero Sport Hiking Water Shoe is perfect for warm weather trail running that might include a stream crossing or two. You’ll leave your fellow trailblazers in the dust as you sprint along the trail in this lightweight yet extremely stable Merrell Hiking Shoe. The ventilated mesh upper makes it perfect for steamy weather and water use, and the classic Merrell Omni-Fit lacing system ensures this shoe will hug your foot in all the right places. The molded TPU heel counter provides you security with each step, and the Vibram TC5+ outsole will enhance your agility by way of optimal traction and grip. Users sing this shoe’s praises for use in water and on slippery wet rocks, as well as in messy muddy conditions (including endurance races), although some recommended pairing them with water-shedding socks for a more comfortable and drier fit. The Merrell reputation for quality vegan footwear is upheld with the Men’s All Out Blaze Aero Sport Hiking Water Shoe, and its popularity with hikers, fishermen, kayakers, and urban explorers makes this item a versatile home run. Related: The Merrell Men’s All Out Blaze Sieve Water Sandal features a waxy leather upper that makes it the perfect water-resisting pair for forging streams and wet-weather hikes. Specific features: The Adidas Terrex Swift R GTX offers the weather a hardy, waterproof (yet breathable) Gore-Tex lining, mesh/synthetic upper, shock absorbing adiPRENE midsole insert, high-traction rubber outsole, and snug, convenient speed lacing. 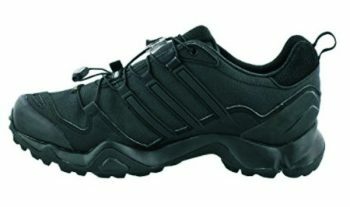 Best use: If you’re looking for a reliable hiking shoe to wear in wet, messy weather, the Adidas Terrex Swift R GTX is for you. Just like our fairytale friend Jack as he leaps over his fabled candlestick, you’ll be both nimble and quick in this breathable, durable, waterproof Adidas Terrex Swift Shoe. The Gore-Tex lining will keep your every step dry as the TRAXION outsole provides a stable landing each time. This popular offering from Adidas offers mid-cut support, speed lacing construction, and the comfort of EVA midsoles and polymide protection plates. Users praise the Adidas Terrex Swift R GTX as being the perfect combination of hiking boot and hiking shoe, although serious hikers looking to complete aggressive trails might want to pass on this lightweight option in favor of a more traditional boot. Wearers will love how easy it is to slip this boot on and adjust the lacing in seconds, making it a perfect choice for mornings at the campsite when you’re ready to get up and go. Users recommend purchasing a good pair of heavy socks to wear with this boot in colder temps. Related: The Adidas Outdoor Men’s AX2 Mid Gore-Tex Hiking Boot is lightweight and mid-cut like the Terrex, and provides ample support and grip for the terrain of any trail. 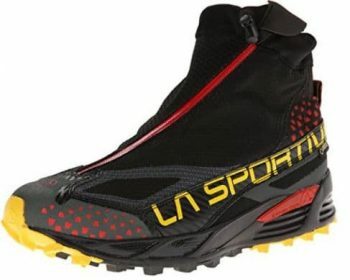 Specific features: The La Sportiva Crossover 2.0 GTX offers waterproof GORE-TEX, AT Grip Zone traction, articulated gaiter zipper, internal lacing system, V-Groove sole, injection molded EVA / TPU stabilized midsole, and a non-wicking Air-Mesh upper. Best use: This high-functioning shoe is well-suited for cold weather trail running or snowshoeing. Cold weather adventurers will love the La Sportiva Crossover 2.0 GTX. Designed to function equally as well as a trail running boot or snowshoeing boot this attractive and versatile boot is also a solid choice for the slopes once you shed your skis. The quick internal lacing system will get you going in no time, and the articulated gaiter zipper provides the best in ankle protection. Maintaining your grip on icy and snowy surfaces isn’t a problem for the La Sportiva Crossover and its Grip Zone technology. Gore-Tex will keep your feet dry no matter where your day takes you, and users report that these boots do a great job of retaining heat even the frostiest winter temperatures. The flip side of this, of course, is that these boots may not be the best choice for warm weather activities. Even runners who stick to sidewalks instead of trails report that this boot makes a good alternative to regular running shoes when Old Man Winter comes to town. Related: Consider the superior traction of the La Sportiva Hyper Mid GTX Boot if your outdoor activities of choice include technical backpacking, fastpacking, or high-speed trail running. Specific features: The Merrell Waterproof Maipo sports an anti-friction lining, non-marking Vibram Waterproof Plus sole, air-cushioned heel, 3.5 mm lug depth, synthetic toe bumper protection, micro mesh upper, antimicrobial footbed, neoprene stretch collar, and traditional lacing closure for a secure and stable fit. Best use: These lightweight shoes are perfect for demanding outdoor activity that isn’t afraid to get a little wet, like canoeing, stream-heavy hiking, or exploring in damp climates. Merrill encourages consumers to “feel the barefoot experience” with this well-constructed, high-quality addition to its family of vegan footwear. Functioning equally well in dry or extremely wet conditions, the Merrell WaterPro Maipo features a synthetic leather and mesh upper, lycra and neoprene stretch collar, and traditional lacing closure for the most precise and customized fit possible. This vegan shoe is not waterproof; it is designed to allow water to drain freely from the shoe, and the materials used ensure that they will dry quickly after a few hours. Some users say that nylon socks help to prevent rubbing and chafing once the shoe gets wet, but others say that going sock-less is not an issue at all thanks to the anti-friction lining (that is also treated with an antimicrobial solution to keep the odor gremlins at bay). Merrell’s unique heel air cushion provides noticeable comfort and shock absorption to keep you going strong all day long. 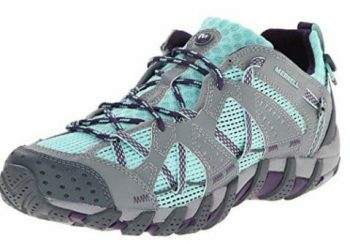 Related: The Merrell Women’s Rockbit Cove Hiking Water Shoe is a true fish-on-your-feet water-friendly “hydro-hiking” shoe that comes complete with lightweight traction to keep you moving swiftly and securely over the wettest terrain. Even if you don’t consider yourself an environmental crusader or dyed-in-the-[synthetic, vegan]wool animal lover, there’s a lot to appreciate about the lightweight durability and impressive performance of vegan footwear. The next time you find yourself in the market for a new pair of hiking boots, trail runners, or wet weather warriors, take a moment to research the vegan options available to you. The planet—and its critters—will thank you for it. Do you have a favorite pair of vegan hiking boots? Can you convince even the most skeptical meat-eater to try animal- and eco-friendly footwear? Do you have an experience to share about your vegan hiking boots or shoes? Tell use all about it in the comments!